Most miners know what hydraulic mining was. 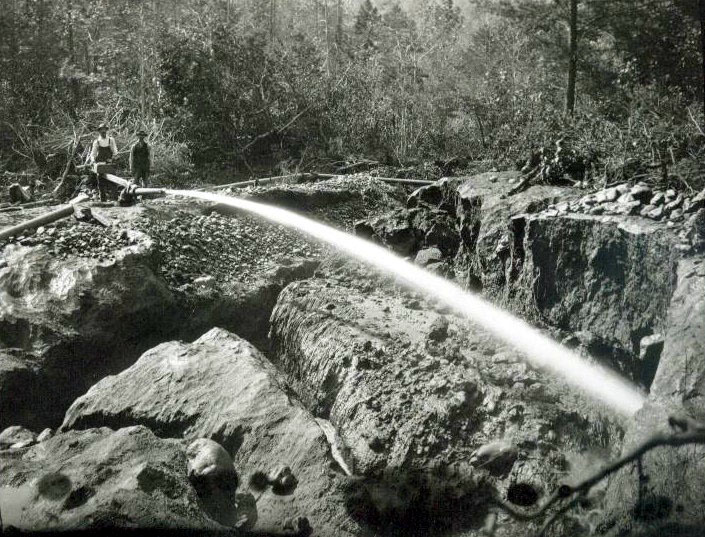 Simply put, it was a type of mining operation that used water under high pressure to wash away gold-bearing material to be run through a sluice box. There are thousands of old hyraulic “pits” scattered throughout the West. These are great spots to find gold nuggets, but they can be difficult to hunt. Some of them are so large, that figuring out just where the best place to hunt can be very difficult. Here are a few tips that will help you if you implement them. The monitors, or “water cannons” that the miners used were set up in strategic locations so that they could wash the ground around them. At first glance it might seem impossible to know where they were set up, but careful evaluation of the ground around you can help you figure it out. Monitors were often perched up on a piece of unmined ground. Look for a small plateau of ground that wasn’t washed away. Closer inspection will often reveal lots of iron rubbish on the ground around it. Once you locate the location of the monitors, you can visualize how the mine was set up. You can see the areas were the water washed, and the areas where the water wasn’t able to reach. 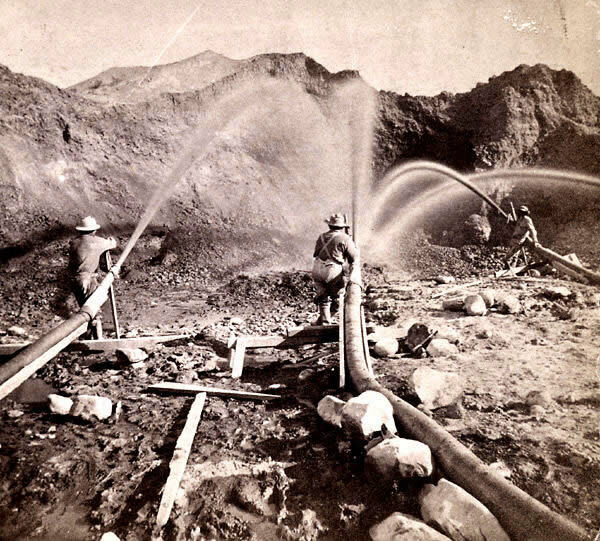 Some of thee old hydraulic mines were run by companies who hired crews of men to work around the clock. The amount of gold recovered was incredible, yet they still missed a lot of gold because of the crude mining methods during that time. You will often notice spots where more rocks are piled up that appear to be flat shaped or perhaps darker, heavier stones. Sometimes they will be on the farther ends of the pits, where the water pressure was too weak to move them. The water may have been too weak to move heavier gold nuggets as well. This is a good area to search with your metal detector. The miners set up sluice boxes down in the gulleys to process all the material they were washing. They were usually less than efficient, and considerable gold was lost. Sometimes the gold was lost when riffles overloaded and gold settled down in the low spots after the sluice, completely missed. Word the bottoms with your detector. Ideally, the hydraulic miners were trying to wash material down to bedrock and clean it thoroughly with water. This didn’t always happen though, particularly toward the far edges of the pit where water pressure was not as strong. Look for jagged bedrock that could potentially trap a gold nugget. If the water pressure wasn’t strong enough, the water would actually help to settle a gold nugget was deep down into those cracks. Yet another good spot to search. Prospectors know all too well about that challenges of clay, and how it will trap gold if it isn’t broke up thoroughly. Well, the old-timers had this same problems. The hydraulic operations would break out clay chunks that contained gold. If they weren’t carefully washed, they would lock up gold. These clays can be worth checking out. Some hydraulic pits are very trashy. Unfortunately, they seems to attract every target shooter within a 10 mile radius! If there is a lot of trash, don’t give up. Use a metal detector with good discrimination and keep hunting, only digging select targets. Have perseverance and you will find some gold nuggets amongst the trash. 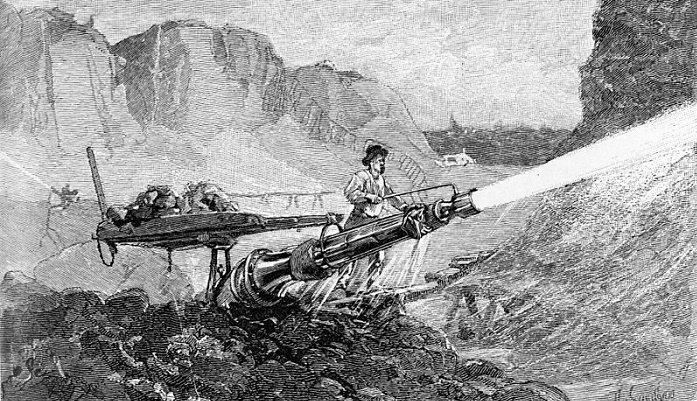 Some of the hydraulic mining pits employed dozens of men and covered hundreds of acres. These were major mining operations and obviously they were finding a lot of gold. There are also small hydraulic operations that are only an acre or less in size. They have have used just a small amount of water from a creek, and may be overgrown with brush and trees now. MANY OF THEM HAVE NEVER BEEN HUNTED WITH A MODERN METAL DETECTOR because they have been overlooked completely. It takes a keen eye to spot them. As always, research is a big part of finding hydraulic pits. They are productive places to metal detect. I hunt them all, large and small. They all contain gold, although not always in the form of large nuggets. Dust, flakes, small nuggets, huge nuggets… you never know what you’ll find when hunting old hydro pits.